Blanks are similar to nulls in SQL Server or Access, but have a number of important differences. This blog page shows these differences, and shows how to use the ISBLANK function. You'll need to create the relationship shown too. 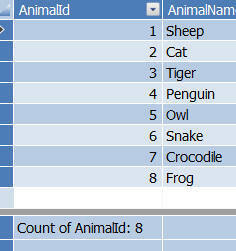 Create a measure to count the number of animals. There is no description for zero-legged animals (possibly because I can't imagine what it would be!). What we can do is to ask the following question: if you try to look up the Description field in the Leggedness table, does this return a blank because there isn't a description to return? This column looks up for each animal's number of legs what the corresponding description would be. Snakes - as ever - are the problem. Here we're testing to see whether the value returned for a given number of legs is blank (ie we weren't able to find a matching record). The headings in the pivot table will now be correct. The leg description looks much better. 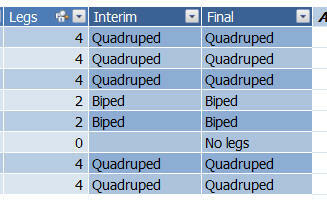 This solution creates a column called Interim, then a column called Final. You can use ISBLANK and =BLANK() interchangeably. And that's the end of this blog!